What do I need to know about chucks before buying a four-jaw? Obviously, I'm a beginner! And this is a very beginner question! I've seen all sorts of advice regarding quality and cost and other stuff, but no information about making sure it fits! Now, I'm pretty sure there is a specification on every advertisement for chucks out there, but I'm missing it. What are the specs I need to know, and where can I find instruction on this sort of stuff? Short version... What chucks fit my lathe, and how do I tell? There was some pretty good discussion here just last week, might get you started. Easy. Look up the spindle specs on your lathe. It will tell you the configuration you need. Budget class lathes usually have a 3 or 4-bolt arrangement (usually with some DIN specification) and some of these also have a locking ring. Others spindles will be threaded with a thread specific to the model you have. Still others will have a camlock spindle, while industrial lathes have their own systems. It really depends on your lathe so which model do you have and maybe we can help you sort it out. What is the make, model, size, etc. of your lathe? What type of mount is used for mounting your chuck; thread on, D1-3, D1-4, etc.? Uh-huh... It is a Millport 1236. I haven't found much of anything that I was sure was really it. What in the world is D1-3, D1-4? What I know at the moment: My three jaw chuck attaches to a faceplate (I think that's what it is called) with three bolts. I have not been able to get the faceplate off. (I'm very determined. I tried once and gave up pretty quickly because I figured I might be doing something I shouldn't.) Should I try to get the faceplate off? Hers some stuff on a D1-4 spindle, its the size of your spindle. Most likely your trying to get the back plate off vs the face plate. Just a naming in the d1-4, I think, like D8 dozer, size of equipment. If you could post more pictures of your lathe it would be helpful. From the few pictures in your earlier post, it's difficult to tell how the face plate is mounted. As mentioned by another member, your lathe looks like it could be part of the Jet 1024/1236 family of lathes, with the exception the lever in the upper left corner..... If it is part of the Jet family of lathes, then there's a good chance the chuck/face plate is mounted the same (which were threaded on to the spindle). As it stands, one of your earlier pictures (pasted above) shows the face plate with the chuck removed. So the style of chuck currently on your lathe appears to be a "plain back" chuck, as it's "plain back" mounts to the flat surface of the face plate. But pictures will help us determine how the face plate is mount to your chuck. Also, when you post pictures of the lathe headstock/faceplate, please also post a picture of the back of the chuck you just removed! It must be common for us new metal lathe people to be confused on getting a new chuck to fit. I figured in the paper manual of my lathe it would give a size that relates to a size listed with chucks. But it appears to be a little more complicated and like all things has multiple ways of getting the same results. This may help in understanding various chuck mounting schemes. Looks like a threaded onto the spindle backplate. Can't see the front of it to determine if it has a register. You could use the diameter of the backplate as a guide for the chuck diameter. As it is not the exact manual for your lathe, please use caution, as the instructions may not be correct for your lathe, and are presented as potential guidance for removing your face plate. Btw, Grizzly manual shows spindle clamps that need to be removed....On many of the earlier lathes like my Jet 1024, there were no spindle clamps. Yes it does look like a screw on back plate and a six inch chuck. I would reassemble your chuck and unscrew the whole lot. I hope you marked the position of which stud went where. Then you need to find the right back plate for your spindle. I would buy one that is suitably machined so that it will just screw straight on. After that you will need to get the chuck that you want that is the right size. Your existing back plate is for a six inch chuck. If you are buying a four jaw you might want to go to eight inch, so you would need an eight inch back plate. I'll leave it at that for now because there is more to be done. 1. Get a chuck that threads directly to my spindle. 3. Get a chuck with separate backplate that threads onto my spindle. With options one and three, it doesn't matter if I am getting a plain back or a D1-4 or whatever other style, right? I just have to get the right thread size? Bad ideas? Which one is best? Which one is cheapest? I was actually looking at getting an eight or ten inch chuck already, so I'm guessing option two is already out. You have a threaded spindle so forget camlock chucks or any other kind of chuck. The only thing that will fit is either a chuck with an internal thread that matches your spindle or a back plate that is threaded to match your spindle. Along with the thread is the register, a shoulder or taper that the chuck or back plate must also match. The thread only allows the chuck or plate to spin on. What holds it concentric to the spindle is the register. The register is a physical feature of your spindle, behind the threaded section. So, take the existing back plate off your lathe and measure the spindle thread. You need the OD and the thread per inch so you can identify the spindle thread. Once you know that, you need to figure out what spindle standard it fits. If that is an asian lathe then it is likely that it is a DIN standard. This standard will specify both the spindle size, threads per inch and the size of the register. Once you sort out that DIN standard then you can search for a chuck that will fit that standard. Your options are to find a chuck threaded to the DIN standards of your spindle or you can try to find a back plate that fits your spindle and mount a plain back chuck to it. I suspect Mauser will have a hard time finding a chuck with a threaded back (Narrow Body Chuck) to fit his spindle ! As far as buying a bigger chuck is concerned, as long as the jaws when stuck out don't hit the bed thats fine. Even so I wouldn't fit a chuck any bigger than the one that the manufacturer would have supplied with the lathe, particularly with a screw spindle. Agreed. I would think an 8" chuck would be about the max, and even at that I suspect 90% of the work that can be done on a 12" lathe could be done with a 6" chuck. It isn't just about what the swing will fit; it is also about what the spindle bearings were designed to handle. How dare you?! Talking me into cheaper tools!? I came here because I thought everyone here was in the business (or hobby) of talking everyone into more expensive tools! Really though... Thanks for that suggestion on the sizing, and the help so far with all my questions. It seems that these size lathes generally ship with a six inch three-jaw and an eight inch four-jaw and a twelve inch faceplate (as far as tooling for holding workpieces go). I only got this six (ish) inch three-jaw when I purchase it, but I'd guess that it should be able to handle an eight inch four-jaw chuck. If you have a good look at your faceplate you will be able to get all the information you need for a backplate. There is no difference apart from size. 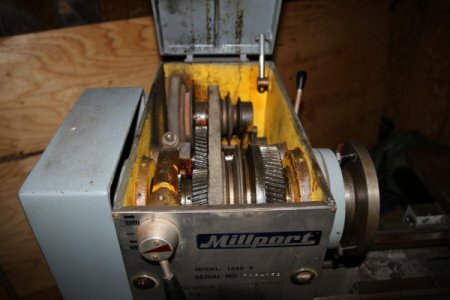 What is the right size chuck for this lathe? I always thought this to be wise advice. I own an Emco 11" lathe and while I could easily fit an 8" 4 jaw chuck on it, I prefer a 6.5". I don't do huge work pieces that would require an 8" chuck and given that the max safe operating work piece weight for my spindle is 99# when held by the chuck alone or 176# with tailstock support, I don't see that I would benefit from that large a chuck. My point is that you should think carefully when choosing tooling for your lathe. If you have a need for a large chuck and your spindle and bearings can handle the weight (the combined weight of the chuck and the work piece) then go for it. However, if you are choosing a chuck based on what will fit or that you think you might need it "someday" then hmmm, think twice. In over 30 years on a hobby lathe I have never needed to turn a work piece that would require an 8" chuck. Obviously, your needs and the needs of others will vary but just be clear on Need vs Want. Joking, but it is good to hear that perspective every now and then! I don't have any solid specs on what my spindle/bearing will take, so it is as much a guess at this point as anything else, as far as my part goes. Don't take it too seriously. Most 12" lathes come with an 8" 4 jaw chuck. The spindle should be able to handle it. Okay, got the chuck off, the major diameter of the threads on the spindle LOOKS to be 2 1/4 inches in diameter with my highly calibrated Stanley tape measure. I am pretty sure eight threads per inch is correct though, unless there is some metric equivalent that is SOOOO close... Here's a pic in case it helps... or not. I was putting off buying another caliper, 'cause I've got one already, it is just three thousand miles away! Moving three quarters of the way across the USA one pickup load at a time has its disadvantages... I've got one coming now anyway, because I don't like living without something akin to precision measuring instruments. You're lucky, 2-1/4" x 8 tpi is one of the more common sizes for screw on chuck back plates & face plates. Much easier than the 2" x 8 tpi of my Jet 1024. Watch eBay. They come up quite often. I'm guessing you could probably purchase a chuck and back plate as a set from Shars. Sounds good. Would it be good practice to make my own backplate? Or not worth it? They are ALL crazy! No matter how sane one seems, she will turn out to be a headache....oh wait, you said "chucks", not "chicks"... in that case, I agree with Mikey, except I only use a 6", and so far I haven't needed anything bigger. I would buy a nice cast iron or steel back plate and get on with fitting your new chuck. Alrighty... It's going to be a while before I pick up a chuck though, probably. Either a really good deal has to come along on the fleabay, or my tool fund needs to get replenished enough to purchase a decent deal or a brand new one. The trouble with being into machining as a "hobby" is that the funds put into it have to be justifiable at the time! That and I'm just slow.